If you are a veteran AutoCAD user, you may remember setting up a revision table on a title block where you could have as many as 100 attributes which had to be selected in the correct order to ensure that they would appear in the dialog in that order. Well thankfully that is all done with in Revit. 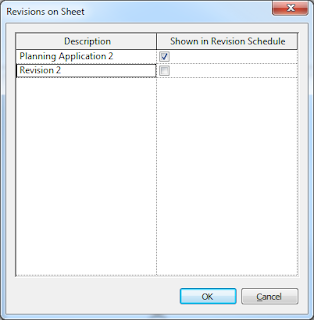 Revit has a built in Revisions schedule designed specially for the task of Revision Control. While editing a Title Block, on the View panel, select Revision Schedule.You will be presented with the Revision properties dialog. If this is the first time you have added the Revision Schedule, you will be presented with some default selections. 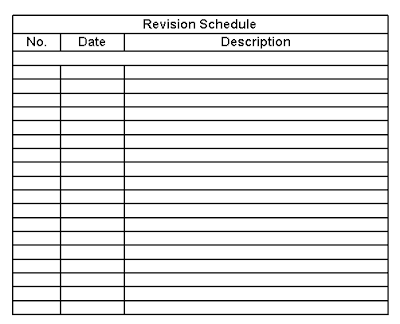 There are 6 possible fields that can be added to the Revision Schedule. 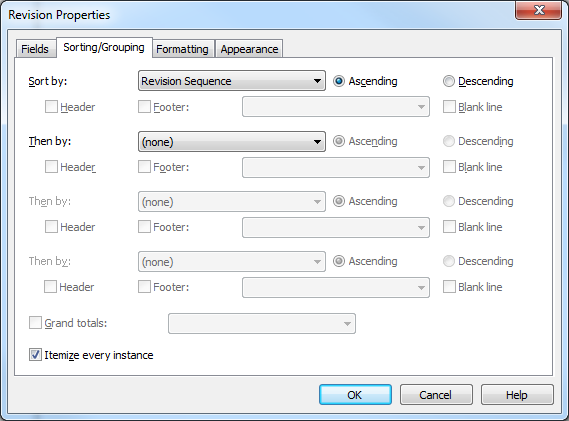 The Revision Sequence, Description and Number are selected by default. The Revision Sequence is a hidden field and maintains the order that the Revisions were added. Revision Sequence An identifier similar to an ID in a database which manatins the order that revisions were made. By default Revisions are sorted by Revision Sequence. You are unlikely to need to change the settings on this tab. 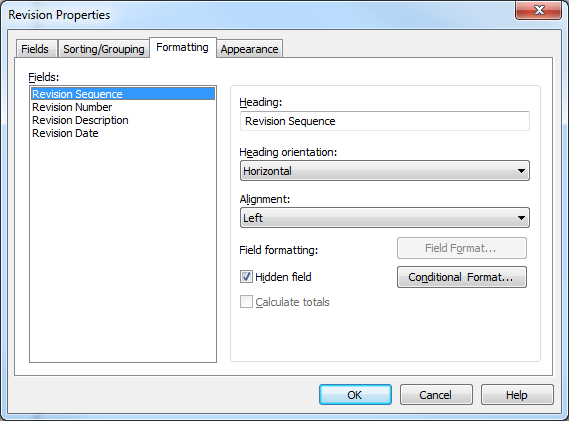 You can define the formatting for each field. You can change the heading title in the revision schedule. You may want to shorten Revision Number to Rev. No. or just No. to maximize limited space in the revision schedule. The Heading text can be oriented horizontal or vertical. The text can be aligned left, center or right. Note: This is the revision and not the heading. Notice Revision Sequence is marked as a Hidden field. You can turn this on if required. Appearance lets you change how the revision schedule looks. Build Schedule - Sets which direction the schedule will grow. If Top Down the headers will be on top otherwise they will be on the bottom. Grid Lines - You can turn them on or off and change the weight. Outline - Define if there is a box around the revision schedule and the wight of that line. 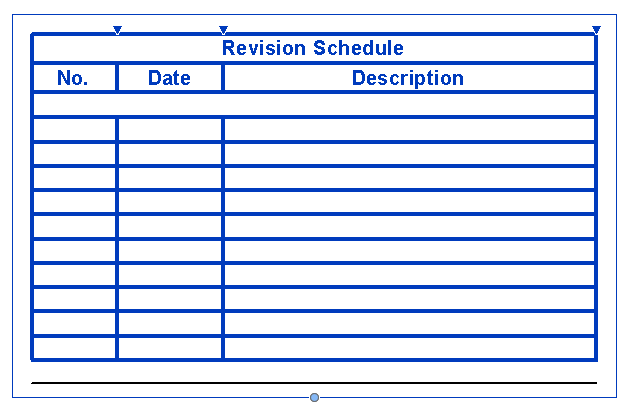 Height - If set to Variable, the schedule will grow to the height required to show the number of revisions. If set to user Defined, the schedule can be defined with a preset number of rows. I maybe traditional on this, but I would have a preference for User Defined as I like to know that the exact size of the revision schedule. Show Title - The Title is the overall heading which is derived from the View name for the Schedule. You can turn this on or off and optionally underline it with a line. 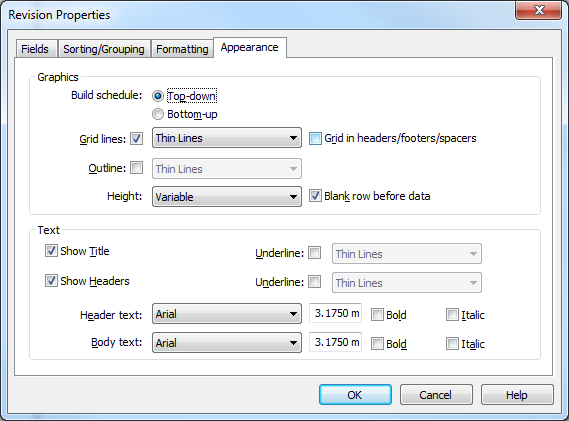 Show Headers - The headers are the field headings which can be turned on or off and underlined. The text font can also be for defined for header and body text. You may need to experiment until you have a suitable text size that fits and is readable. I have used 1.6mm for the headings and 1.4mm for the body text which is just about readable. Once you have completed the configuration of the schedule, you can add it to the sheet by dragging the schedule from the Views section of the Project Browser. 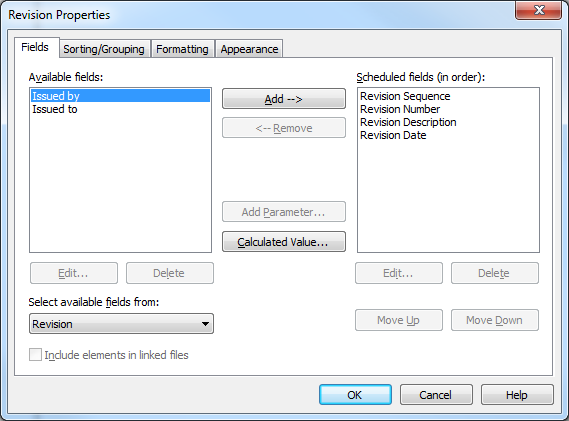 At any time before of after adding the schedule to the sheet, you can change the layout in the Properties palette. The following is an example of what your revision schedule might look like. Finally, you will need to adjust the width of the table and columns. Click on the schedule on the sheet. Adjust the widths of the table or column by dragging the little arrows. You can adjust the height/number of rows by dragging the little blue circle at the bottom or top of of the schedule. Save your changes to the Title Block and click Load into project from the Home panel. 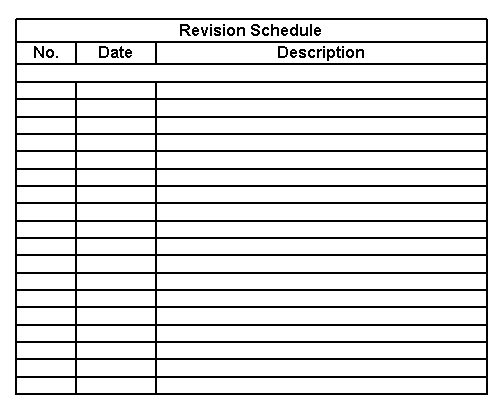 Great, we have a revision schedule that looks nice, now how do we add revisions? Things are a little different to the AutoCAD way of doing things but for good purpose. Lets say you have 10 drawings to issue. In AutoCAD you would typically go into each drawing add the next revision number or letter, put in today's date and ad a short description of the changes or purpose of issue. This has to be done individually for each drawing. In Revit, you add one revision and then apply it to the relevant sheets. Revit will take care of the numbering or lettering. 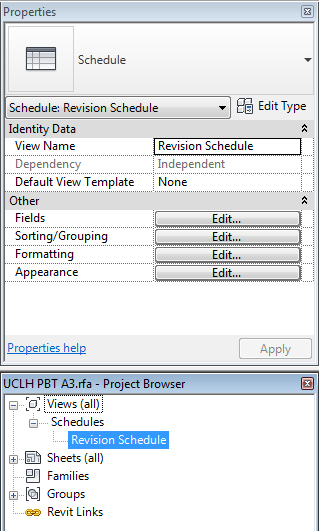 To create a revision, on the View Panel, select Revisions from Sheet Composition. You will be presented with a dialog box showing all Revisions. You need to make 2 important decisions here before you proceed to add any revisions to a project. 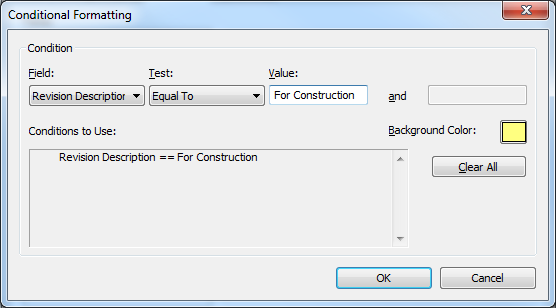 By default, Revit will use numbers e.g. 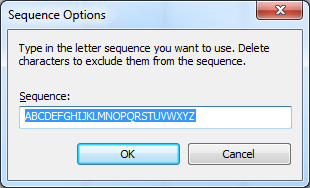 1,2,3.. You can change this to Alphabetic Sequence by clicking the options button under Alphabetic Sequence. You cannot use numbers, spaces or repeat characters but strangely you can use characters like &$£. You can switch from numeric to alphabetical at any time but the sequence will restart e.g. 1,2,3,A, B, C.
Revisions have a Sequence. Remember revisions are sorted by this field but we made it invisible. If you select Per project, all revisions will use this numbering system. This has the effect that numbers or letters will be skipped. If you use Per Sheet, Revit will automatically adjust the revision numbers or letters so that they are in sequence. Per Sheet is likely to be the more popular solution as recipients will wonder why they got Revision 1 and 3 but not 2. For this example, lets use a Numeric revision system with Per Sheet Cloud Numbering. Click Add to add a Revision. Enter a date and Description for the Revision and then click OK. Select a sheet from the Project Browser. Click on the Edit button beside Revisions on Sheet. Do this for each sheet you want to issue. With all this great information, it would be wonderful if I could group all these sheets together for a particular Revision and export them to DWF or PDF in one go. You can, sort of. 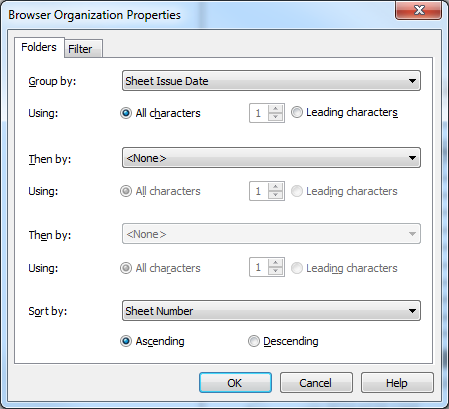 Remember from my first blog that you can group and sort sheets by various parameters. 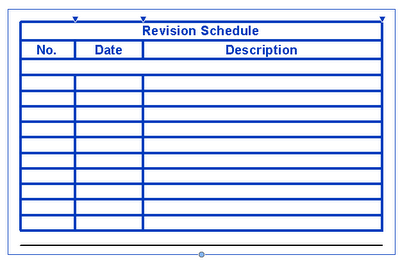 If you use Per project Numbering, you can group sheets by Current Revision and this works perfectly. If you used Per Sheet Numbering, then this will not work as the current revision number could and probably will be different on each Sheet. A workaround is to ensure the Sheet Issue date property is set on each Sheet and then sort by Sheet Issue Date. There seems like a lot of work in this but once the revision schedule is on the title block, you can almost forget about it. If you haven't used Schedules in Revit before, you are most of the way there in being able to create and manipulate component schedules. I was going to look at Cloud Revisions but I can tell that this is more than enough to consume for one day. Revit 2016 has updated revisions to allow it to be more flexible as up until now the only option was alphabetical or numeric sequenced revisions. A lot of organisations have traditionally used the P1, P2, etc. sequence for up to construction stage and the C1, C2, etc. then. Revit 2016 now allows you to include a P, C or another other prefix you wish to use. Beware, the prefix is applied to all sheets in the model so it really only works if you are making a clean break between pre-construction and post construction. Checked By seems to have been left out. This again would have been traditionally used by many organisations for QA as each revision would be checked. The only workaround is to have a project information shared parameter for Checked By. This is not ideal as the value once set for a sheet may never be changed whereas revision values need to be updated for each revision. Revisions are one of those low hanging fruit benefits to using Revit. They not perfect but the alternative is to create lots of shared parameters similar to how attributes were set up on AutoCAD. Each sheet then needs to be individually updated which is time consuming.